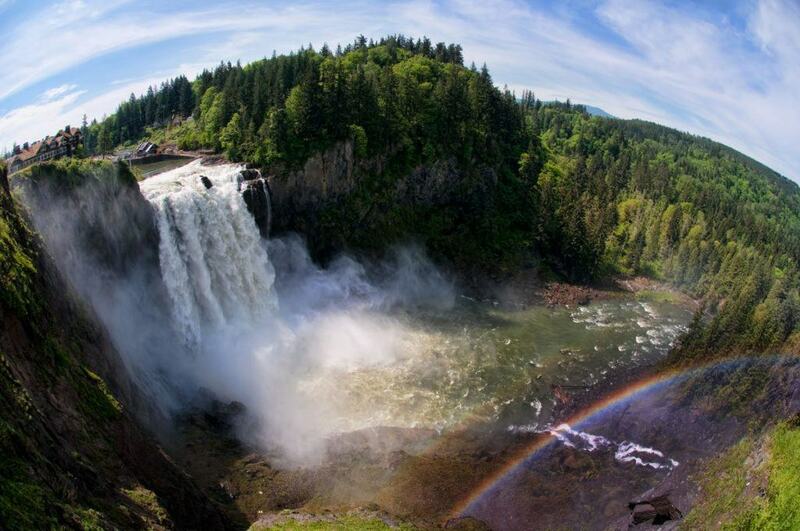 Every day we go to Snoqualmie Falls and help our guests take photos of the magnificent view of the falls. People often ask what the best way to get that silky smooth look of the falls with their cell phone is. In the past, we might suggest an app that allows you to slow down the shutter speed or if they had a camera, a Neutral Density filter and a tripod were required. The quality of the photo will not be as high as with a DSLR like the one above, but it’s a pretty cool effect for a camera in your pocket. Well, that has all changed with the upgrade to IOS 11 for those of you with an iPhone 6 plus or newer. The significant part of this update, you can go back to old photos that you have shot before the update and re-edit them. First, you’ll need to upgrade to IOS 11. As of this writing, IOS 11.0.3 is having some issues with degrading battery life as well as a security issue that might allow unauthorized access to your photos. So you might want to wait for the next version. I am currently using 11.0.3 and have no issues with battery life however. Go to Settings>General>Software Update and then download and install. As with any upgrade, make sure you backup your photos and data. Go into your camera and click on the icon between HDR and the timer icon to turn on the Live function. 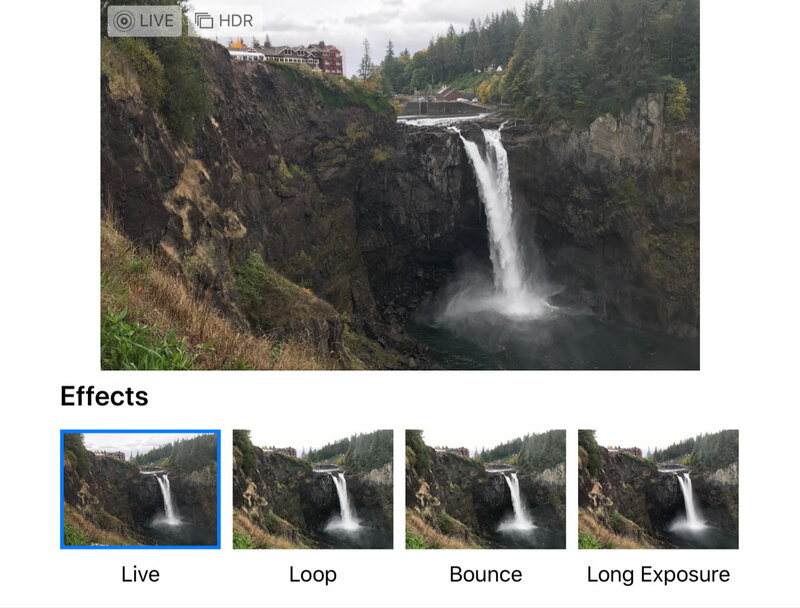 Take the photo of the waterfalls in the Live mode. Make sure you hold the camera real steady or brace it against a railing or put on a tripod like a Gorillapod for the best results. Spend $6.00 for a universal phone mount to make it easier to shoot on your tripod. Open your photo that you just shot and then Swipe up. You will have four options to change your photo. Choose the Long Exposure option as seen above and you are done. You might want to experiment with the other options such as the Loop and Bounce options. If you are a user of Instagram, the bounce option is the same as their Boomerang effect. We have seen some pretty great uses of this effect from our customers at the falls and other locations such as jumping. The loop option continually plays the photo and works really well for waterfalls such as Snoqualmie Falls. This is my final shot with this effect, with a bit of cleanup with sharpness and contrast in Photoshop. You could also do this effect with not only waterfalls, night scenes and maybe a pounding surf. Though there is a limitation as to what you can accomplish with this effect as the iPhone only shoots 8 frames to merge together. 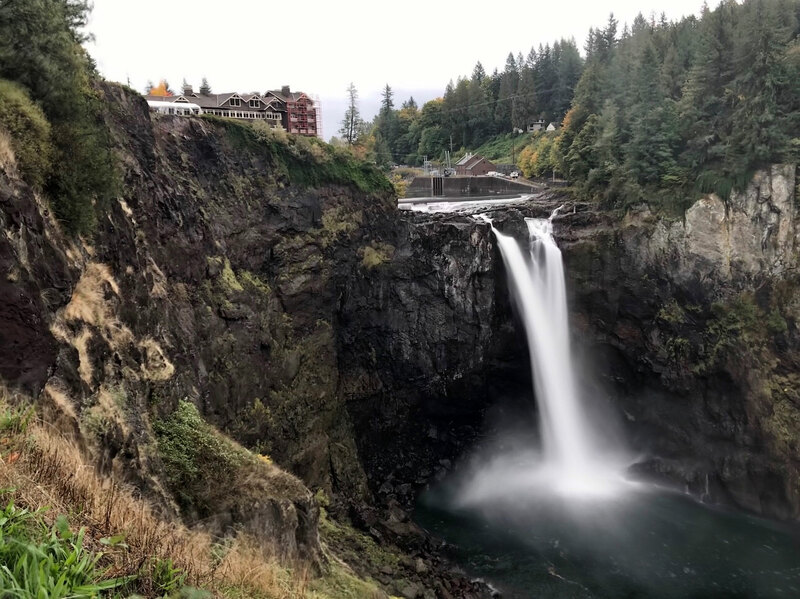 If you’d like to join us on a trip to Snoqualmie Falls, you can learn more about our Snoqualmie Falls and City Tour on our site. This entry was posted in Tours and tagged photography. Bookmark the permalink.